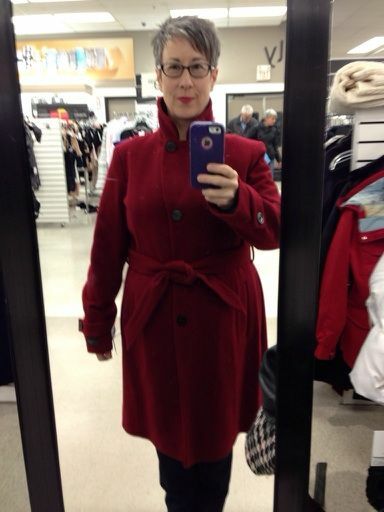 Returned the navy coat (thanks) and found this lux cashmere blend red-berry anne Klein coat. Sleeves are too long and it has room to layer a blazer. These are terrible pics but what do you think? Buy or walk away? ETA: So at home now and have taken a few more pictures that hopefully show the coat a bit better. The last two pics are with a sweater and my Theory blazer underneath - I need to be sure it can be layered for the cold. What do you think now that you can see it better? I ended up having to overexpose the pics a bit to show the detail but unfortunately that has skewed the color some. The color is more properly represented in the first three pics from the store. If keep, I will have to get the sleeves shortened (no biggie) and should possibly look at having the belt loops raised a bit, although I'm not sure it's bad where they are placed. I'm going to be taking my new TR Cameron slim BF jeans to Wonder Woman today for hemming. I have started pinning hems myself - not that I don't trust her, I most certainly do - but it saves time when I go and drop off items and I always seem to be piggy-backing a bunch of errands so it's just more convenient. 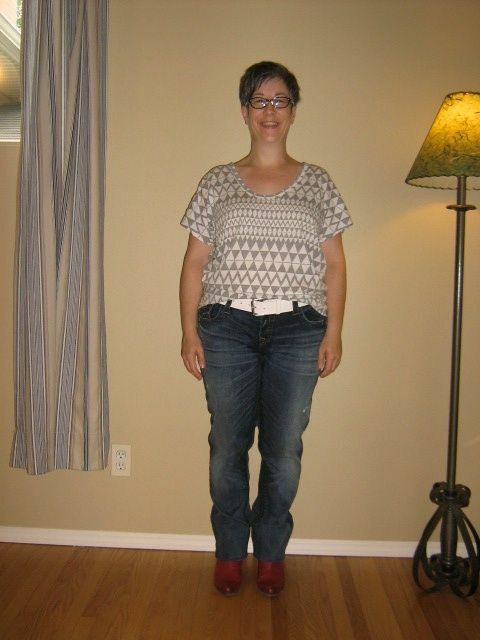 I'm showing the jeans with my red booties first - unfortunately because there is about 4.5 inches of excess fabric folded under, they are not quite sitting right on the top of the boot which is pushing up the fabric a bit and bunching at the knee. So I'm not sure this is the best representation. I then switched the boots to my patent pumps so that the legs sit properly. I think this probably shows the length more accurately. Does this look about right? shorter? longer?